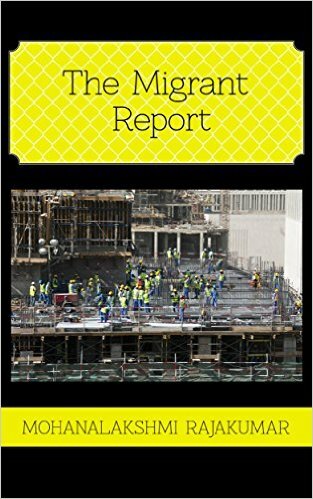 It was with some trepidation that I started on The Migrant Report by Mohanalakshmi Rajakumar. A murder-mystery set in a Gulf state (**shush! **), involving lower-income migrant workers. The book would remove the invisibility cloak migrants in the Gulf don, only to reveal a negative characterisation. It would tug at the stereotypical emotional strings of the migration narrative. Two of those fears were completely misplaced. And, yes, there were those emotional strings of family, ailing mother, poverty, but only to the extent a work of fiction demands. Every character in the book is sketched with great sensitivity and nuance. As in her earlier works, Mohana’s brings a lot of insight and layers to her male characters. Be it fresh-off-the-boat Manu, or the well-meaning but always in trouble Daniel, or Ali, the Qatari cop, and even Nasser who only makes the occasional appearance. She wills us to fall a little in love with these strange men. Not one for great details or long-drawn out scenarios, the author still manages to vividly represent the many relationships in the book. Cindy and Sanjana, Maryam and Daniel, Daniel and Sherif, Manu and Santana, Maryam and her family, Maryam and Ali. She brings out daily frustrations and stifled aspirations even within brief exchanges between the characters. It requires courage to write a book such as this. Not just about migrants, but the secret lives of expatriates, while still being one. That she has done well, mining the experiences of her many years living in a Gulf state herself. The book manages to not bracket migrant workers as being completely helpless, and shows them as resourceful people. Without being patronising, it manages to show them as strong people, even if in weak situations. The book is self-published, hence does not have the advantages and resources of a publishing house. It could do with a good bit of editing and proofing. Chronology of events is mixed up in places. Also, its Gandhi, not Ghandi (Americans!). The book covers a wide range of plots and lives and the author seems to have rushed through it in many places. Spending a little more time on some of the scenarios would have enriched the book – the mysterious happenings at the labour accommodation; Manu and Sanjana’s relationship; Maryam and Ali’s interaction; the disconnect between Cindy and Paul. At several instances it seemed like the writer thought of a great idea, but instead of developing it, just drops it there between the pages, running away to meet the next shiny idea. Maybe that’s what a sequel would address. Maybe. While the expatriate environment and that of the Arab household has a sense of familiarity, the brief look into Nepal and the labour accommodation seems borrowed. More research would have helped. I am not sure I would classify it as a crime-thriller. Not yet. Do pick up the book, it’s definitely a good read. I read it in just a day and a half. That’s not to say it’s an easy read. The loneliness of the characters, their struggles and the faint reflection of our own lives will leave you thinking about the sequel. PS: May I also suggest you pick up Love Comes Later & Dohmestics by the same author? They both give rarely available insights into life in the Gulf.